WOW is back for another chart-topping year! 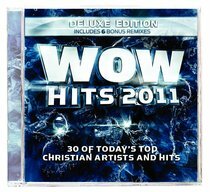 The WOW Hits 2011 CDs deliver 30 awesome tracks; the DVD features 22 hit videos - all showcasing the very best new music from today's most popular Christian recording artists, including plenty of familiar names plus lots of exciting new talent! Includes: Casting Crowns, TobyMac, Third Day, MercyMe, Chris Tomlin. WOW Hits 2011 Deluxe Edition features an additional 6 remixes from Third Day, Jars of Clay, BarlowGirl, Group1Crew, Sanctus Real, and Hawk Nelson. About "Wow Hits 2011 Deluxe Edition"